52 Ancestors, No. 13: Fr. 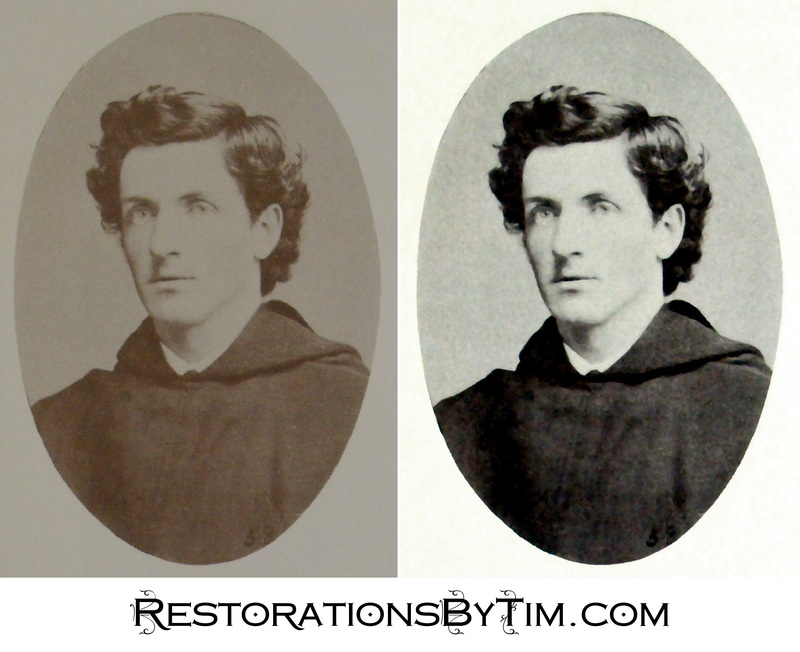 Francis J. McShane, Augustinian Priest and Villanova University President | Photo Restorations by Tim G.
Ancestor No. 13 is the Reverend Francis J. McShane, O.S.A. (of the Order of St. Augustine). My great-uncle wrote to me a couple of weeks ago and asked me to clarify our relationship to Fr. McShane. You see, their granddaughter, my second cousin will shortly be getting married at St. Nicholas of Tolentine Church in Philadelphia. St. Nicholas was an Augustinian, like Fr. McShane, so they are looking perhaps to tie our family’s Augustinian heritage a little more tightly into the celebration. Well, Uncle Gabby came to the right place, because I happen to know the answer to his question. Fr. Francis J. McShane, O.S.A., was the uncle of my great-great-grandmother, Anne (McShane) Graham. That would make him my third-great-granduncle, and the same for the bride, who is also in my generation. A history Our Mother of Consolation Parish, where Fr. Francis J. McShane was once pastor. Fr. Francis J. McShane was born in February of 1846 to Terence McShane and the former Bridget McNichol. The bio does not go much into his early family life, but I can tell you that he appears in the 1850 U.S. Census as living in Philadelphia, being twelve years of age, and with his mother and six older siblings. His father, Terence, was not in the picture at that time. I don’t know if Terence ever made it to America. I have not yet found trace of him here. Francis’s eldest brother, a boatman named Peter, died in a drowning incident two years later. His next oldest sister, Mary, husband of one Daniel Burns, died after complications of childbirth in 1865. Another sister would die in 1885. A few of Francis’ nieces and nephews also died in their youth. Without a doubt, the McShane branch of my family tree has been the most unfortunate with regard to untimely deaths. You’ll find a short biography of Fr. McShane at the Necrology on the Augustinian.org web site. I’ll summarize the high points. He lived for a time with the Brothers of the Holy Cross in South Bend, Indiana, and began studies at Villanova in 1868. He was ordained at Philadelphia on February 29th, 1872. He worked in various locations in Pennsylvania and New York. Beginning in 1886, he served as pastor of Our Mother of Consolation Parish in Chestnut Hill. In 1894 he assumed the position for which he is probably best remembered today, that of the President of Villanova University. The University hosts an interactive timeline of its past presidents on its website, which includes a feature on Fr. McShane. He held that position for only a year before moving on to the parish of St. Nicholas of Tolentine in Atlantic City. There, he oversaw the building of a newer, grander facility which still stands as a monument to him. 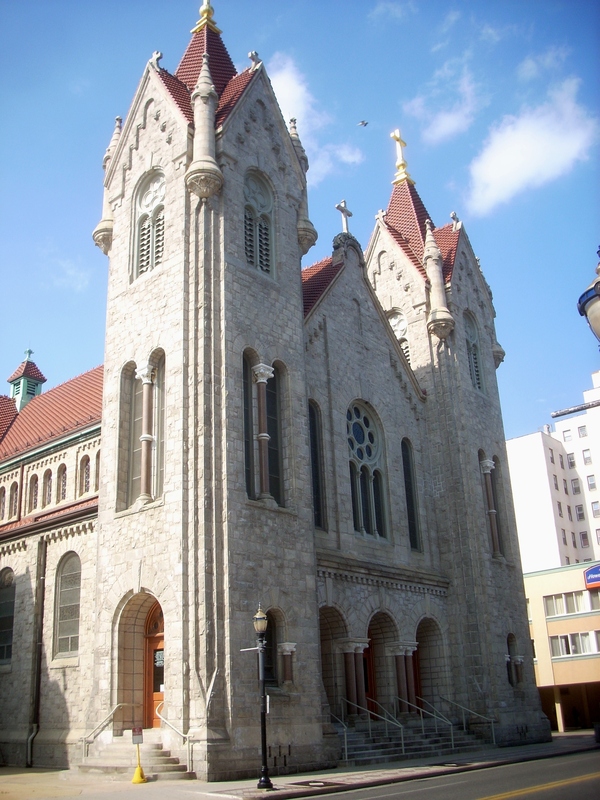 It was added to the National Register of Historic Places in 2001. In 1918, after his work in Atlantic City, he went on to establish the Augustinian College in Washington, D.C. From there, in 1926, he returned to Villanova for the close of his illustrious professional career. Fr. 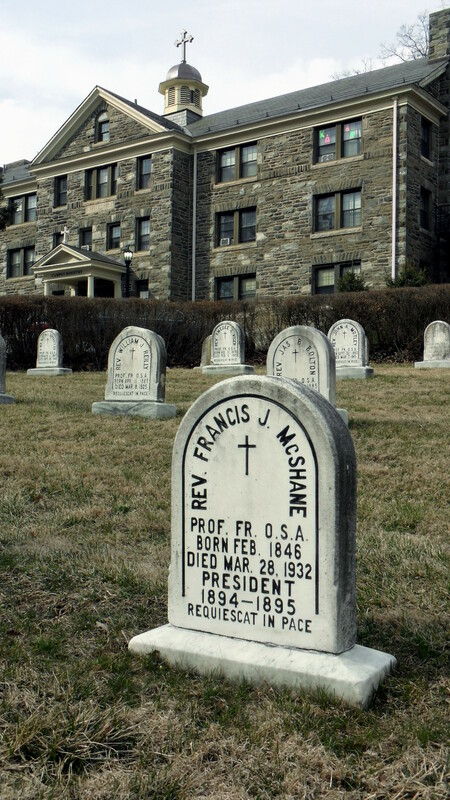 Francis J. McShane died in Philadelphia on March 28, 1932. His final resting place is at the small Augustinian Cemetery on Villanova’s campus. The Augustinian website has posted a fine biography of this great Philadelphia priest, but my research continues. I last week I visited the Philadelphia Archdiocese Historical Research Center (PAHRC) at the St. Charles Borromeo Seminary in Wynnewood, PA. The archivists there were very helpful in retrieving for me some original CV of my other family priests, but told me that they did not keep original documents on the Augustinians. For that, the archivist recommended a visit to the Villanova University archives, where I will be travelling in the coming weeks. I would most like to see Fr. McShane’s CV, for that likely be the source for the necrology’s identification of Terence McShane as my fourth-great-grandfather. 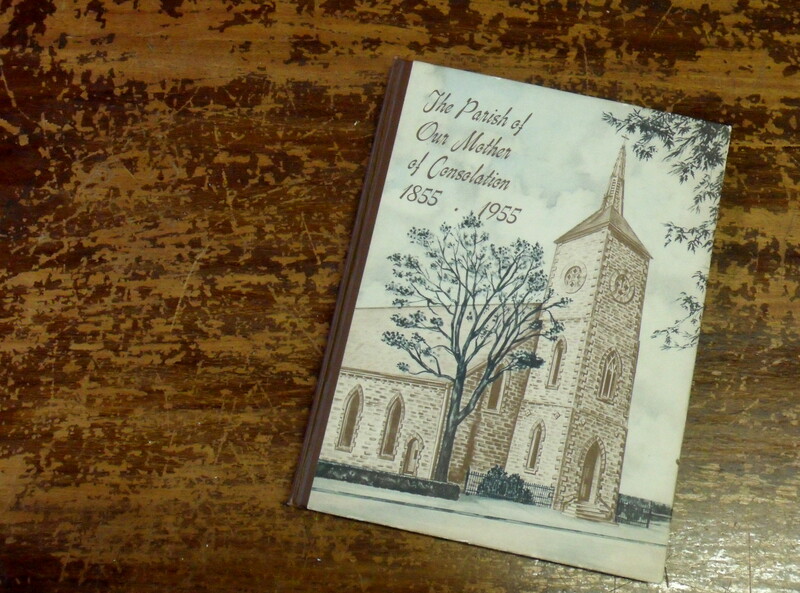 The archivist at PAHRC was able to retrieve for me the above pictured history of Our Mother of Consolation Parish, which included the picture of my featured photograph of Francis J. McShane. I captured the picture using the close-up macro on my CL65 handheld camera. It was a fine looking photograph, so I had not much to do in the way of repair. These might come out a little grainy if the light is not sufficient, and printed photographs like this will always reveal halftone dots when viewed up close. In this case, I’ve chosen to apply the artistic oilify filter, which attempts to approximate an oil painting. Click the photo of Fr. Francis J. above to see the result of this effect. Here’s to remembering Fr. Francis J. McShane, O.S.A., on the 82nd anniversary of he death. Fr. Francis J. McShane’s final resting place at Villainova University. Thanks to Villanova, Augustinians.org, and PAHRC for making the information used in this article available to the public at their respective websites and locations. 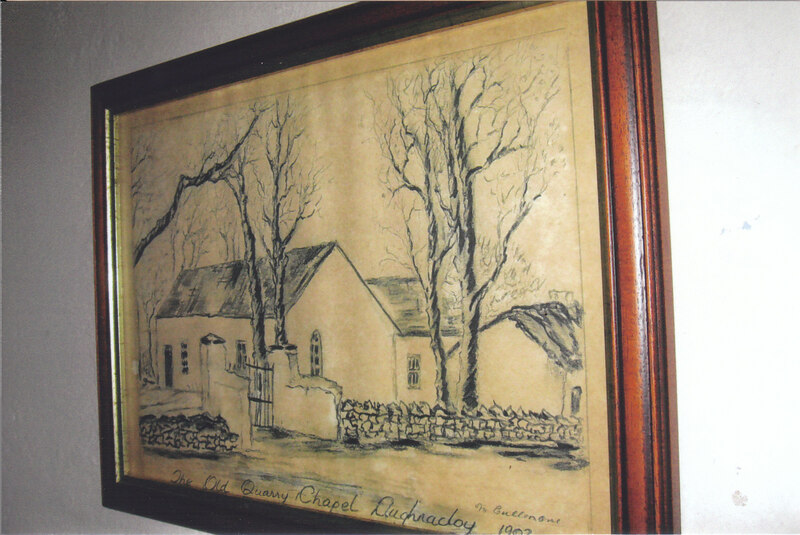 UPDATE, 4/19/2014: Here is a photograph of a drawing of the church in which Francis J. McShane was baptized in 1846. This was the stone chapel at Aughnacloy, County Tyrone, Ireland. It was razed in 1902, and stone from it was used to build the new church, which still stands. My Great Uncle Thomas J. “Gabby” Garberina took this photo a few years ago, while on a trip to Ireland with his wife, my Great Aunt Eileen (Graham) Garberina. For a little more on the church, and additional pictures, see my entry for Fr. McShane’s older brother, Patrick: 52 Ancestors, No. 14: Patrick McShane, Irishman. Boatman. Milkman. Watchman. Stone chapel at Augnacloy, as it appeared in 1902.